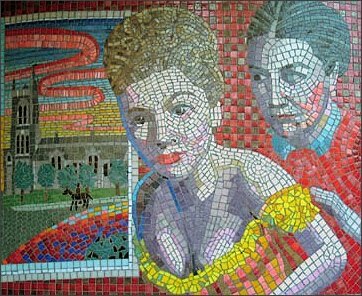 To commemorate the 100th anniversary of Hitchcock's birth in Leytonstone, England, a series of mosaics were commissioned for the entrance to the local Underground Station. I just saw Alfred Hitchcock's Rebecca (1939) last night after several years. It inspired a few random thoughts. I think you might find them useful, or at least interesting. During the opening credits, this title appears: "David O. Selznick presents its picturization of Daphne Du Maurier's celebrated novel, Rebecca." My comment: I'm guessing this was to reassure Du Maurier fans that the film would remain faithful to the novel and a rebuke to Hitchcock, who was sharply criticized by Selznick for for attempting to deviate from it. During the opening scene, which takes place at the gate to Manderley, the mood is spooky, ethereal, dreamlike. In a voice-over, we hear the unnamed heroine, Mrs. DeWinters, a.k.a. “I” (Joan Fonatine) say, "Last night I dreamt I went to Manderley again.... I stopped at the gate. And then, like all dreams, I was possessed as by a sudden supernatural power and passed like a spirit through its bars...."
My comment: One of the charms of Rebecca is its uncanny tone -- the ghostly "presence" of Rebecca De Winter; Mrs. Danvers' somewhat necrophilic quality; the seeming hauntedness of the mansion, Manderley, itself. Mrs. De Winter is imbued with a sense of the supernatural as well. She passes "like a spirit" through the gate. Later, she enters the cottage on the beach -- with a degree of unusual confidence, as if she had already been there. She also connects with the dog Jasper in ways that suggest her attunedness to that which is beyond the ken of everyday human life -- something Hitch had hinted at earlier in Secret Agent (1936). With the exception of Danvers, everyone else in the movie has apparently accepted Rebecca's death and is at least trying to move on. Only Mrs. DeWinter seems to be sensitive to her predecessor's lingering presence. Timid though she is, she alone seems to be acutely sensitive to the ghosts that haunt Manderley. Thought 2.5 -- A question, really. Danvers and the second Mrs. DeWinter are diametric opposites. Where Danvers is antiseptically cold, rigid and uncompromising, Manderley's new bride is all "daisies and rainbows" (to quote Ingrid Bergman in Notorious), collapsing into tears and spasms of joy, all the while compromising herself to the point of total abnegation. So it was fitting that, once Danvers saw her world falling apart, she gave herself over to self-annihilation. In the car with Maxim in Monte Carlo, "I" says: "I wish there was an invention that bottled up memories...."
My comment: There is. They're called dreams. They're also called movies -- both of which we get to see in Rebecca. Settled into their home routine in Manderley, Maxim and Mrs. De Winter set up a projector and watch home movies that they made during the brief idyll of their honeymoon. Soon enough, though, this pleasant interlude is interrupted when she is discovered to have broken a valuable statuette. The "invention that bottles up memories" works – until reality comes crashing in. Rebecca is a Chinese box of recollections. Set in a household that is haunted by memories, the above scene fits into the film's structure this way: Rebecca is a film that is also a memory, part of which is another film that is itself a memory. It has been said that Mrs. Danvers never enters a room, but that, specter-like, she always “appears.” In the second scene at Manderley, we see Mrs. Danvers knock on the door and then enters. So much for that bit of lore. Maxim's sister comments on Mrs. DeWinter's frumpy appearance, saying, "Maxim is usually so particular about clothes." This could be describing Hitch himself, of course. 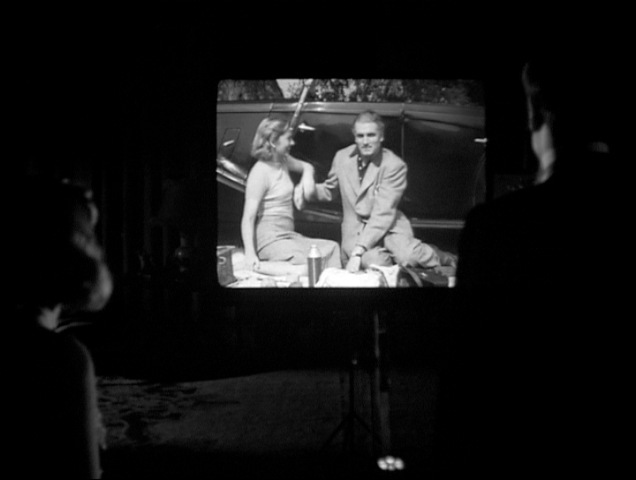 I find this interesting, because Hitch was almost viciously inattentive to Fontaine during the shooting of the film. His indifference made her feel unsure of herself and contributed to an anxiety-soaked performance that netted her an Academy Award nomination for Best Actress. 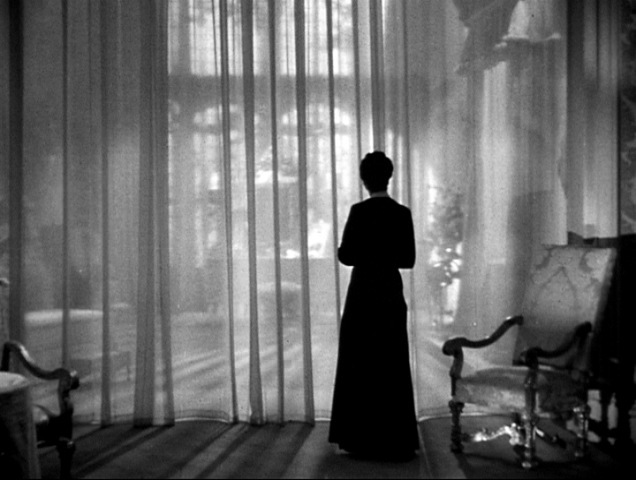 After taking Mrs. De Winter on bone-chillingly tour of Rebecca's room, Mrs. Danvers walks over to the window to look out at the sea. She is freeze-framed for just a moment, as the shot dissolves to a view of the waves crashing below. Beautiful. Surreal. Jarringly haunted. Perfect. I guess that'll do for now. Rebecca is a movie that just ties me up in knots inside. I remember the first time I watched it being completely unable to sit still everytime Mrs. Danvers appeared. 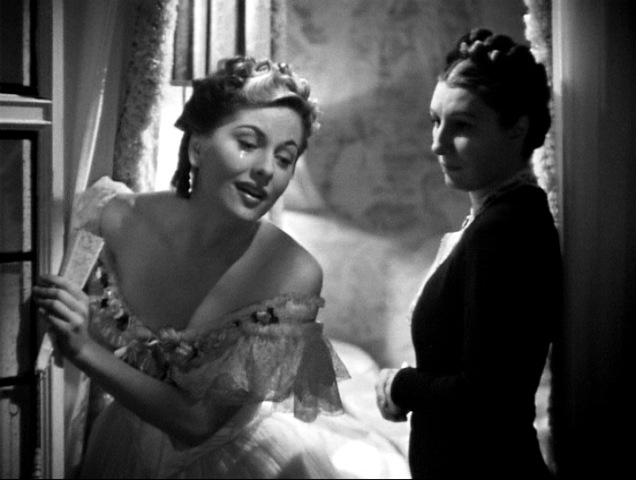 I just project myself so strongly into Joan Fontaine's performance. This is not a movie I reach for again and again, just because it takes a lot out of me. It is so painful to watch. Spoto and others cite this an example of Hitch's misogyny. But I see it as just the opposite: he set up the terrible situation precisely to invoke our compassion for the poor woman. Thought 1 - In my opinion the appearance of David O. Selznick's name is purely because a) he owned the film being the producer and Hitch's boss and b) he was a huge ego manic so he would have wanted top billing to reassure him self and express his dominance over Hitchcock. Thought 5 - Excellent point. I find it baffling when actors and actresses complain of being treated badly or in a mean manner when a director is clearly trying to sub consciously direct a star to not act unsettled but feel unsettled. Take The Shining where Kubrick harassed and bullied Duvall to get that performance out of her but she never seems to have figured out that's what he was doing and the reason he was doing it. Joel Gunz - I totally agree. It's a shocking sign of a lack of understanding on critics’ part to confuse telling a story on a subject and interpreting that as the story tellers own opinion on a subject. Does that mean all directors of films with murder or child abuse as the subject are murderers and child abusers? Exactly! Kubrick, Lang, Hitchcock and many other great directors could be either merciless or indulgent, depending on the need and their artistic aims. It's the opposite of mysogyny, I think. The book is an update of Jane Eyre. (Poor governess marries rich man of her dreams who solves all her problems, mansion gets burned down symbolically.) Even Charlotte Bronte was aware of the inequalities in this situation and addressed them in her own peculiar way. "I"'s position as a lady's aid, is the same class of servant as the governess, not quite family, not quite servant. It's a limbo situation, where the person within is actually more vulnerable and more unprotected than someone who was a definite lower order. In marrying Maxim, she'd seem to solve this problem, but instead it's made worse because she's not really accepted as part of his world. Not only do we feel sorry for her, but we take on all the assumptions she makes, assuming that Max still loves Rebecca, assuming that she's not in control. The movie preaches assertiveness as a survival mechanism. Interesting comments about class. I wonder if or how far Hitch might have identified with this in some way. In England, as son a of a greengrocer, lacking a title or an Oxford education, he never would have made it truly into the upper classes, though his wealth and fame were at least on par with them. In coming to America, he might have seen an opportunity to the respect he couldn't have gotten in England. Going to have to watch this movie again to better appreciate it. Don't suppose it comes on DVD though. Yep, there are a couple of very nice DVDs to choose from!